Which kinds of language-minority students, instructional methods, and program models are we talking about? Are we using the same terms to refer to the same things? What instructional practices and programs work best for which students? When are they appropriately used? What’s needed to successfully implement them? What are the advantages and risks of different approaches? What do the most rigorous and reliable research reviews tell us about English language acquisition? About the role of students’ native language in teaching reading, learning academic English, and succeeding academically? What are some pervasive misconceptions that continually cloud the discussion? This publication synthesizes information from several authoritative sources in order to begin answering these questions in ways that can foster better educational practice and accountability for the success of ELLs. Instructional coaches from outside a school offer fresh eyes and needed expertise to school improvement efforts. But to be effective change agents, they must build a genuine partnership with each teacher they coach. 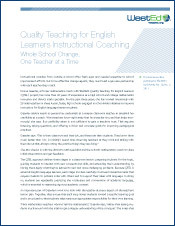 The WestEd Quality Teaching for English Learners approach defines three stages in a classroom lesson. Read on. This policy brief argues that next-generation college- and career-ready standards signal a fundamental shift in the expectations for sophisticated language practices required of all students. This shift has enormous systemic and policy implications for English learners, who represent more than 40 percent of the state's K-12 students.